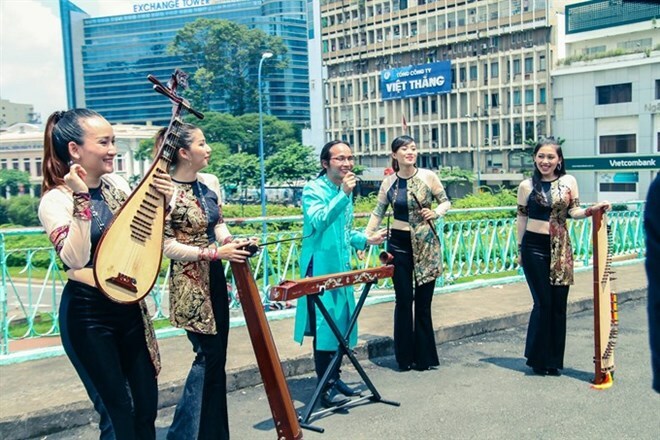 HCM City (VNA) - A hundred of Vietnamese singers, actors, MCs and models recorded a song together to cheer on Vietnam’s National Football Team at the region’s biggest sports event, the 29th SEA Games in Malaysia next week. Nhung Ngoi Sao San Co (Football Stars) is a composition of songwriter and dan bau (a Vietnamese one-stringed zither) player Ha Chuong. It is produced and mixed by DJ Wang Tran. The song contains a message from Vietnamese fans encouraging all players to play well and bring home the gold medal. The work’s beat is a mixture of Latin rhythm and electronic dance music. It also has a few sections of dan bau played by Chuong. The song was sung by dozens of famous singers, such as Phuong Thanh, Thanh Thao and Nguyen Phi Hung, along with bands of MTV, Lip B and VMusic. MCs Thanh Bach and Quoc Binh and models Tien Dat and Duc Vinh also joined in the performance. “I believe the song will help our players relax and motivate them to win the champion at this year’s SEA Games,” said Wang Tran, who has been DJing for 15 years and won several international prizes. He launched his first world tour through 20 countries in May. The music video for the song was directed by Huynh Phuc Thanh Nhan, who made several successful television shows such as Nguoi Hung Ti Hon – a Vietnamese version of the American talent show for children Little Giant, and Ca Si Giau Mat – Vietnamese version of a Korean singing show Hidden Singers. The video was filmed last week at the Mong Bridge in district 1 and Ho Xuan Huong Gymnasium in district 3 with participation of all the artists and 100 dancers and 100 university students.